City Hall guided tours are free and are offered to all ages by knowledgeable tour guides. During a tour of City Hall you will learn about municipal government, discover Edmonton's past, and marvel at City Hall's art and architecture. You may even have a chance to see City Council in action! All tours begin at the Citizen and New Arrival Information Centre in the main foyer of City Hall. Tours are approximately 1 hour in length but can be adjusted to accommodate the needs of your group. Please request a tour at least 2 weeks in advance. Groups should be a minimum of 10 people and groups larger than 30 will be divided to ensure quality for all participants. Request a tour by using our online form. New and established residents alike discover so much about their city during a tour of City Hall. Find out what services your City has to offer and how you can take part in your local government. 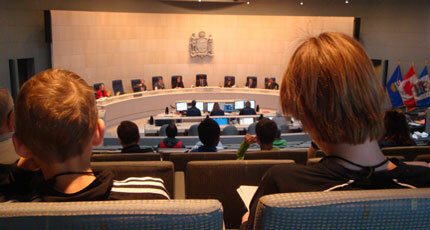 If you are planning to visit Edmonton, book a tour of City Hall! Young and old alike enjoy discovering Edmonton's past and admiring City Hall's art and architecture. During this free guided tour, find out about all of the exciting things that happen in Edmonton anytime of year! Get a group together and spend some time at City Hall! The building is wheelchair accessible and has elevators for your convenience. This free guided tour is fun, informative and set to the pace of your group. During your time at City Hall you could also stop by the Hallway Cafe for tea or for lunch. Whether you are Cub Scout group looking for an adventure or you are planning a conference and need an activity to support your cause, City Hall is the place to go! Specialty group tours can be customized to cater to a variety of special interests. These free guided tours can be requested to support themes related to Edmonton history, governance or City Hall art and architecture. City Hall provides free guided tours for groups of visitors new to the English language. These tours provide basic history, a look at City Hall architecture and people associated with Edmonton's municipal government. Free public tours will take place every Friday in July and August from 1-2pm. These tours are drop-in only and there is no requirement to pre-book online. Additional free public tours will be offered in conjunction with Edmonton's Annual Historic Festival and Doors Open event on Monday July 2 and Tuesday July 3 from 1-2pm.